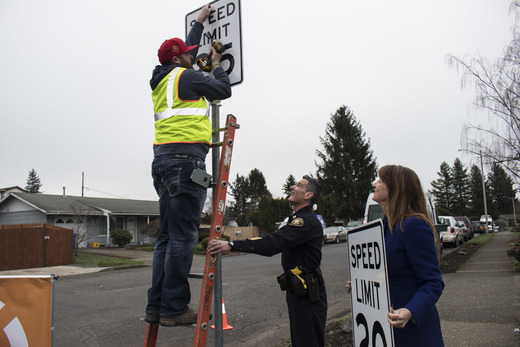 Transportation Director Leah Treat and Portland Police Bureau Captain Michael Crebs help PBOT crews switch out the first speed limit sign at SE 168th and Stark. Photo by Hannah Schafer, Portland Bureau of Transportation. 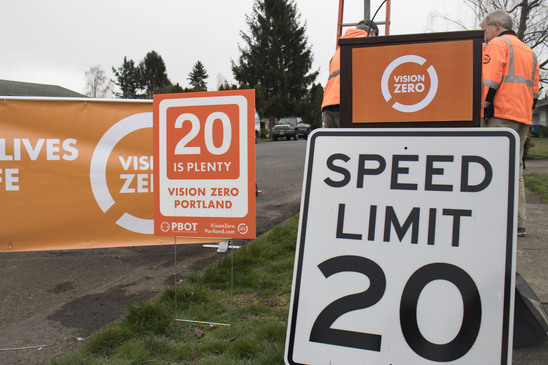 (Feb. 6, 2018) The Portland Bureau of Transportation began to implement a new 20 mph speed limit change on Tuesday, as crews posted the first of about 2,000 signs that will cover nearly 70 percent of city streets. 20 is plenty for Portland's residential streets. Photo by Hannah Schafer, Portland Bureau of Transportation.